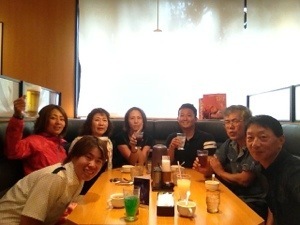 Kyo FBGC(Facebook Golf Club) congratulations party ikimashita. Honto ni arigatougozaimasu. Ippai oishii yakiniku tabemashita. Ippai present morratta. Konshu ippai power morratta. GANBARIMASU!! Konshu Hyogo no tournament ganbarimasu. Kino Fumikurasan, Nakamurasan, Hirone, Takachan to Nabechan ouen kite arigatougozaimashita. Kino Phiten no Pro-am ikimashita. Isumo Phitensan no support arigatougozaimasu. Mainichi inner sukaimasu. Karada ga raku desu. Arigatougozaimasu. Phitensan no chajou wine moratta. Arigatogozaimasu. What I couldn’t say in my speech yesterday. I didn’t really get to say what I wanted to say yesterday toward the end of my speech. I guess the guy who ran the ceremony thought I already finished my speech after my pause. First of all, I have to thank my caddy, Makoto to keep me calm throughout the tournament. 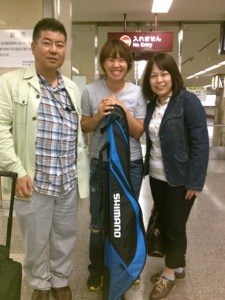 Then, I want to thank my parent to introduce me to the game of golf. I really wish my family were there with me, especially my grandpa. Thank you ETGA team for all their support, especially Ezuresan. He really believes in me. I might say he believes in me more than I believe in myself. I really couldn’t do it without you. 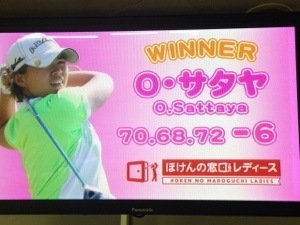 Thank you my sponsors, Miyata Space & Craft Thailand, World Golf Network, Adam, PMJ Wedge for their continuing support. Thank you Zuizenji temple for letting me stay while i’m in Japan. Thank you people who I couldn’t mention here for supporting me. I am very thankful to have all these great people in my life. 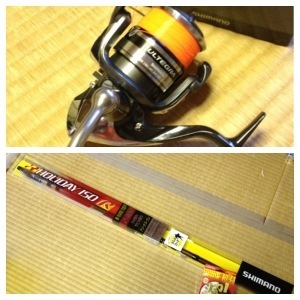 Can’t wait to try my new Shimano rod and reel.